ST. GEORGE – With rumors floating around that President Barack Obama may designate the Bears Ears National Monument in San Juan County as early as next week, Utah Republican Sen. Mike Lee took to Facebook Tuesday night with a video to share his response with constituents as well as to ask the president to reconsider. The new national monument would potentially cover 1.9 million acres and encompass 40 percent of San Juan County. Lee touches on concerns that the president would be unilaterally designating the new monument via the Antiquities Act, with little regard as to whether or not it is a move supported by residents. According to Lee and others, it most certainly is not. “We don’t have anything close to that, not among elected officials down there, not among the people generally down there,” Lee said in the video. The senator goes on to state that he will work with the incoming Trump administration to make sure the designation never happens, and if if does, to see to its undoing. We have to remember that when Sally Jewel, the Secretary of the Interior, went through the Senate confirmation process after she was nominated … I asked her about how she would use this authority, how she would advise President Obama in using the Antiquities Act and she made a pretty solemn promise at the time. In other words the local affected communities, those most directly impacted by presidential designation of a monument under the Antiquities Act, would need to enjoy widespread local support. We don’t have that in San Juan County. We don’t have anything close to that, not among elected officials down there, not among the people generally down there. I want to make clear, if heaven forbid this does happen, I will work tirelessly with the incoming Trump administration to make sure that this national monument never gets off the ground; to make sure it is undone, that is defunded, unrwritten, rewritten, repealed, whatever it is that we have to do to undo it. Opponents of the potential monument designation call it a federal “land grab” that would greatly restrict access and use of area. In a county where only 8 percent is private land, San Juan County Commissioner Phil Lyman said, restrictions on general access due to a monument designation could bring the biggest negative impact to county residents. He also echoed Lee’s statement that local support for the designation is non-existent. If Obama is looking to cement a part of his legacy with another national monument, Lyman said, it won’t be a flattering one. “If the president wants to leave a legacy, this would leave a legacy of arrogance and collusion with special interest groups, not to mention a disregard for representative government,” Lyman said. Utah Republican Rep. Jason Chaffetz, who has San Juan County in his congressional district, also said he hopes the president does designate the monument. 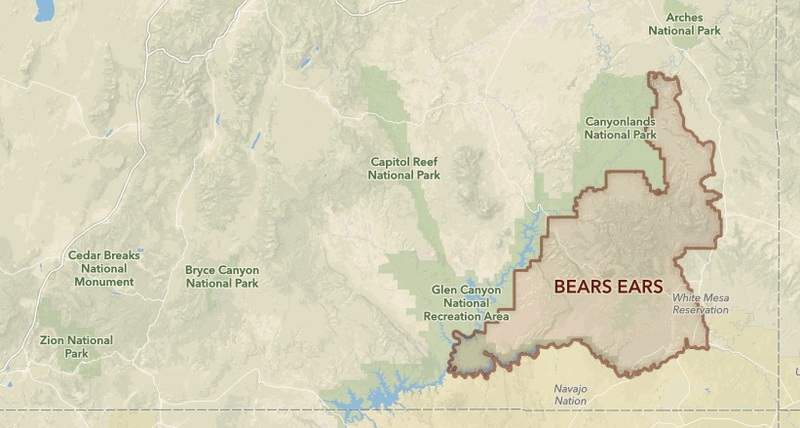 Supporters of the Bears Ears National Monument include the Southern Utah Wilderness Alliance and Bears Ears Inter-Tribal Coalition. They argue the area needs to be protected in order to preserve a wealth of Native American archeological and cultural sites from destruction and looting. They also seek to restrict potential drilling by oil, gas and potash companies they say are eying the region. Uranium mining and “irresponsible off-road vehicle use” are also counted as threats to the area by the monument supporters. St. George News/Cedar City News reporter Tracie Sullivan contributed to this story. Ed. note: The dateline of “ST. GEORGE” notes where this article was written, and not necessarily where the events detailed within occurred. If I was a San Juan resident losing all that looting income I’d be upset too!!! Since the Trump candidacy/election the bar for “disturbing” events has been significantly raised. No matter what your political stripe, Bears Ears NM designation would be small potatoes compared to what else has come and is coming down the pike. And they wonder why Utah doesn’t vote for democrats. I wonder if Obama will go to Arizona to do it. With the House, Senate, and Executive branch they need to amend the Antiquities Act to specifically close this loophole. It was never meant to be used the way it has been. It was meant to protect small, specific sites, not massive swaths of land. I am all for the national monument designation. How else will our lands be protected? Do our elected officials care? Nope! This is absolutely fantastic news and a wonderful idea and I would like to thank all those involved in making this possible. Praise the Lord ! Where in the Constitution is the authority for the federal government to own land outside of Washington, DC? Aww, the poor little whiners won’t be able to turn the area into a big open pit mine, or litter it with oil and gas drilling rigs. We should set up a crying room for them, poor babies.